10/3. etron fou leloublan / hep! 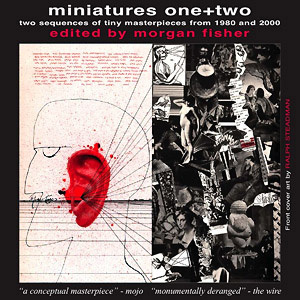 “Much more than a traditional compilation or sampler... Fisher commissioned new soundworks... cutting across as wide a swathe of music as could possibly be imagined... Miniatures was special, and important... the sheer breadth of approaches... almost unprecedented at the time and still impressive today... Fisher, whose taste was impeccable. 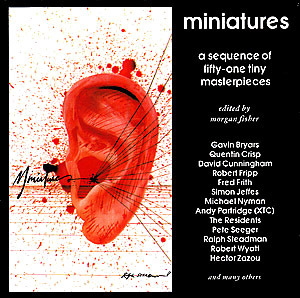 “Irreverent and charming, this unique collection of 51 one-minute-or-less pieces (almost all exclusive) was concocted by Mott the Hoople keysman Morgan Fisher in 1980. 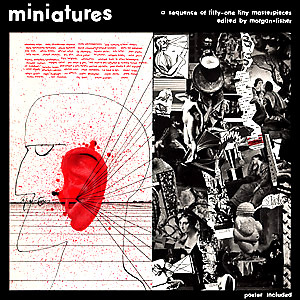 Miniatures works surprising well considering all of the jarring juxtapositions and actually helps to make the set exhilarating many times. Fascinating covers come from Pete Seeger (whistling Beethoven), Half Japanese (demolishing the Rolling Stones), the Residents (squeaking the Ramones), Neil Innes (Bonzo Dog Band) having his son shouting Slade, and Robert Wyatt (looping Frank Sinatra). Also featured are an inspired cast of English loonies like John Otway, Kevin Coyne and Ivor Cutler as well as 'non-musicians' such as psychologist R.D. Laing, writer/actor Quentin Crisp, and artist Ralph Steadman. Most impressive are the artists who do poignant encapsulations in their time limit: Fred Frith's Entire History of Henry Cow, and Andy Partridge (XTC) lecturing on the history of rock and roll. "one of the strangest albums of all time"